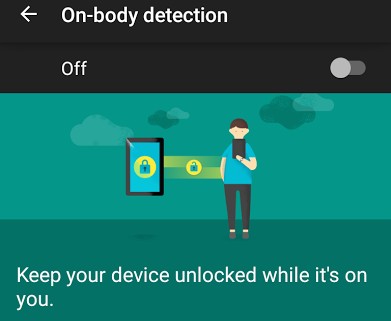 Android users are beginning to see an option for on-body detection in version 5.0 and up, which lets you unlock your device once, and then have that unlock grant you continued access without having to re-enter your pin, so long as the smartphone or tablet never leaves your person. It’s just a convenience feature, and one that can be optionally enabled to let you more easily access your device, but it adds another option to Android’s growing stable of ways to make device use more painless. Like Trusted Places, Trusted Devices and Trusted Face, the feature is designed to give Android devices yet another signal that they can remain unsecured. For Apple, a key convenience addition came to the iPhone (and iPad, later) thanks to Touch ID, which allows unlock via a simple long touch with the thumb on the home button. This greatly enhanced device security overall largely because it encouraged people who weren’t using a PIN to set one up, since it lowered the friction required for the unlock process immensely. Android’s series of trust flags, introduced in Lollipop, have a similar intent, albeit with a very different approach to the problem. For Google, using a hardware component like a fingerprint scanner is less viable in terms of introducing a core software component to handle this, because it serves hardware from a number of OEMs, and only a small percentage of those even employ fingerprint sensors, and those that do don’t use a common standard. The various options now available don’t require any special hardware (they use a device’s camera, Bluetooth radio, GPS, and accelerometer) and can be enabled in any number of combinations based on a user’s preference and comfort level. You could activate Trusted Devices and not On-Body Detection, for instance, or just Trusted Places, or Trusted Places and Trusted Devices and On-Body Detection, and so on. On-body detection isn’t fool-proof – quickly handing your phone to someone else is not going to be enough to break the unlock and require the PIN once again, for instance. But it’s a good step in making devices more situation-aware in terms of their level of security, and agains, is designed primarily as a convenience feature that’s likely aimed more at getting people who normally abstain from such measures using more security features like passcodes. If it’s like Google’s other Trusted services, it might not work as consistently as I’d necessarily like, but it’s a very cool little trick to enable using only software and existing sensors in mobile devices. If you aren’t seeing it just yet, keep checking back, as it appears to be rolling out slowly via updates to Google Play Services.